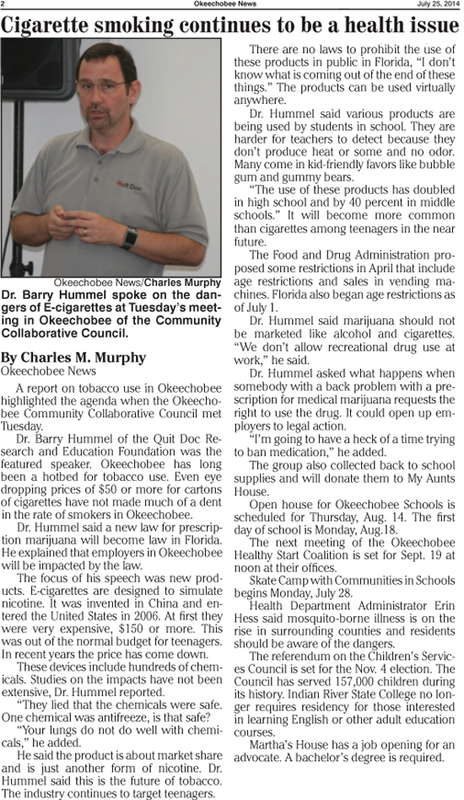 Dr. Barry Hummel, the Communications Director for the Tobacco Prevention Network of Florida, gave the presentation at the monthly Okeechobee Community Collaborative Council on July 22, 2014. Dr. Hummel presented on the emerging issues of electronic drug delivery devices such as e-cigarettes, and their potential use as a delivery system for marijuana. The presentation covered the early history of electronic cigarettes, from their invention in China in 2003, to their export across Europe and into North America by 2007. Dr. Hummel noted that several countries, including neighboring Canada and Mexico have banned their import; meanwhile, in the United States the Food and Drug Administration (FDA) has dragged their feet on regulation at all. Dr. Hummel then focused his attention on the marketing of electronic cigarettes in the absence of any regulation by the FDA. Early on, the strategy was to market the products as a safer way to smoke, with advertising that implied that you could "smoke virtually anywhere". However, after Lorillard purchased Blu E-Cigarettes, the marketing strategy began to reflect the advertising campaigns of the tobacco industry during the 1950's-1970's. Smaller companies, which are under less scrutiny, took this a step further by creating flavored products that are much more appealing to youth. 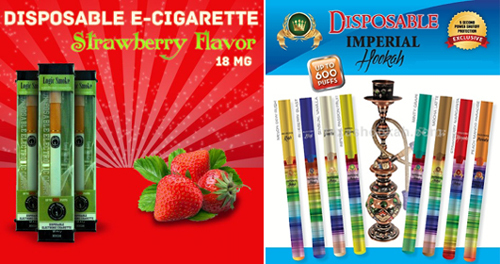 As a result of these alluring products, and the lack of age restrictions on sales, the use of electronic cigarettes among underage minors doubled between 2011 and 2013. Even more notable, is that the use of the devices by youth who never used traditional tobacco has actually tripled over the same period of time. Dr. Hummel expressed his concern that this data reveals that electronic cigarettes are becoming a new route for youth tobacco initiation and addiction. Dr. Hummel also briefly touched on Amendment 2, which is on the Florida ballot this November. Amendment 2 would guarantee Floridians access to marijuana as medical therapy. Dr. Hummel's main concern is that legal medical marijuana, coupled with poor rules regarding the use of electronic drug delivery devices, will create an environment where people may be able to use pot at work. "Legal medical marijuana may create a loophole that would not exist with a recreational drug," added Dr. Hummel.